The Baron’s Motor Inn is an affordable and friendly boutique hotel just 30 minutes from downtown Ottawa. We are situated in the heart of Lanark County – the Maple Syrup Capital of Ontario – in the scenic and conveniently place town of Carleton Place. Travelling West on Highway 7 from Ottawa, the Inn is off to the left, as you cross McNeely Avenue, bringing you into our bustling historic town. We are conveniently situated just minutes from the downtown core of Carleton Place where you will find many options for shopping and dining, as well as great things to do and see for the whole family. Bridge Street boasts an eclectic mix of retailers, specialty shops, friendly shopkeepers and of course, a range of dining options. Within day-tripping distance of many attractions within the Ottawa Valley, we are positioned in the centre of a very desirable vacation destination. Read more about local events and attractions. Many choices for dining and eating out are located within walking distance or a short drive of the Inn. Simply ask our guest services representative for complete directions to any of our distinguished establishments. We would be pleased to offer recommendations based upon your specific needs and desires. 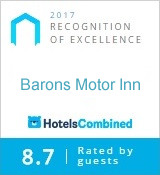 We look forward to welcoming you to The Baron’s Motor Inn.